Hyperpigmentation, the medical term for skin discoloration, is caused by overproduction of melanin. When the darkening appears in large patches on your forehead, cheeks or temples, it is called melasma. Hyperpigmentation can result from hormonal changes--such as those caused by pregnancy--excessive sun exposure, inflammation and medications. Rarely, hyperpigmentation is caused by Addison's disease. Daily Glow advises seeing your doctor if you have unexplained darkening of the skin. Hyperpigmentation is not dangerous, but it can be disfiguring. Some people turn to natural remedies to treat their hyperpigmentation. Use common fruits and vegetables to create a natural skin lightener at home. Apply a small amount to your wrist before use to make sure you're not allergic to any of the ingredients. Mix 1 tsp. of lemon juice, 1 tsp. of honey, 1 tsp. of milk powder and 1/2 tsp. of almond oil. 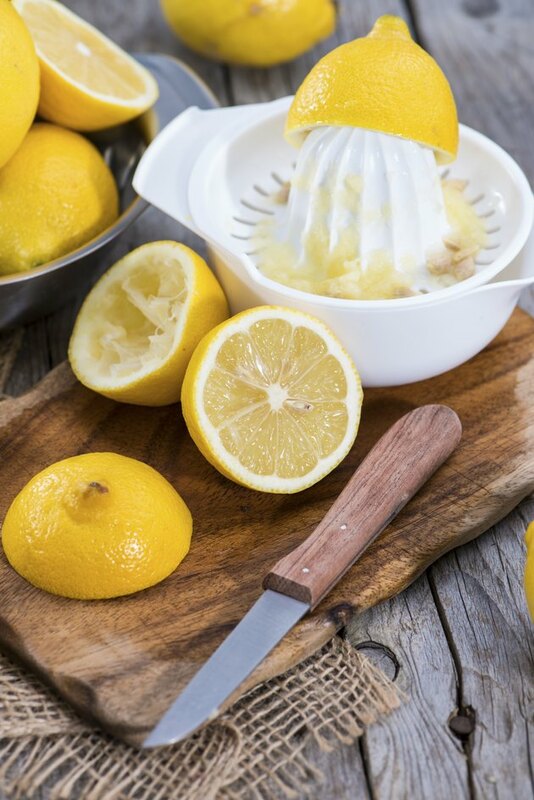 Dr. Jerome Z. Litt, assistant clinical professor of dermatology at Case Western Reserve University School of Medicine in Cleveland, says lemon juice, in addition to being a bleaching agent, has acidic qualities that allow it to act as an exfoliant to gently peel away the top layer of skin, revealing lighter skin underneath. There is some scientific evidence supporting lemon juice's use in treating hyperpigmentation and melasma. In a clinical study published in the August 2004 issue of International Journal of Dermatology, researchers studied the effects of ascorbic acid--a constituent of lemon juice--as compared to those of hydroquinone. Although ascorbic acid was not as effective as hydroquinone, it still improved the condition of 62 percent of the patients. Researchers noted that ascorbic acid had the advantage of being almost devoid of side effects and advocated its use as a melasma treatment. Apply the mixture to the affected area, being careful to avoid your eyes. Allow it to remain in place for 10 to 15 minutes. Rinse the mixture off with cool water, using a damp washcloth if necessary, and pat your face dry. For best results, use this lightening treatment weekly. Mash 1/4 of a peeled, ripe banana, and stir in 1/4 tsp. honey. According to Daily Glow, honey has antiseptic properties and may have the capability to minimize scarring. Add 1 tbsp. of fresh, whole milk to form a smooth paste. You want a mixture that is moist and easy to apply but not so drippy that it falls off your face. Milk contains lactic acid, which can reduce pigmentation and help reduce signs of aging. In a clinical trial published in the 1996 issue of Archives of Dermatology, researchers found that lactic acid improved hyperpigmentation on the facial skin of women ages 40 to 70. Apply the mixture to the affected area, and allow it to remain in place until it is dry--usually 20 to 25 minutes. Rinse off with lukewarm--never hot--water, and pat your face dry. You may also be able to reduce hyperpigmentation by rubbing a piece of sliced red onion over the area. Litt says that it has the same peeling effect as lemon juice.